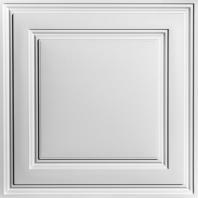 This office drop ceiling is anything but basic with our beautiful Stratford Ceiling Tiles in White. We had old acoustical tiles in our home office. As we looked for options, we weighed aesthetics and cost. We found Ceilume on the internet and saw it had received good reviews, so we gave them a try. The cost was great, we were able to "recycle" the old acoustical tiles by keeping them in place, and the Ceilume tiles were easy to install since we were able to cut them with scissors. The Ceilume tiles gave our office a "facelift" at a very affordable price. It has been a very good experience!